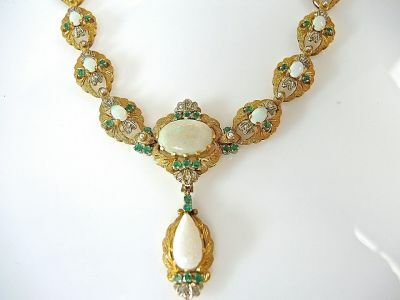 A beautiful vintage 19 kt yellow gold necklace with 1 pear shaped cabochon orangy red-yellowish green opal, est.2.55ct. ; 19 oval cabochon orangy red-yellowish green opals; est.9.06ct; 53 round facetted cut medium green emeralds, est. 2.38ct. and 45 rose cut diamonds, est.0.45ct. (SI clarity: H-I-J colour) and 19 seed pearls, approx. 1.7mm. The necklace is 15.5 inches (40.92cm) in length. Please make an appointment to see this beautiful necklace.